Co-author of both the Acid Reflux Solution and The Swiss Secret to Optimal Health, Susan Wyler, RD, is a licensed clinical nutritionist with a master’s degree in public health from the University of North Carolina at Chapel Hill, where she practices at Triangle Nutritional Wellness. 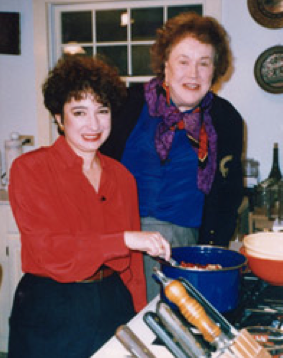 Former food editor of Food & Wine magazine, and a highly regarded writer, she has written many cookbooks, including Cooking for a Crowd, Simply Stews, and Julia Child’s favorite, Cooking from a Country Farmhouse. A friend is bragging about your “Three Mushroom Lasagne with Gorgonzola Sauce” on Facebook and her friends are asking for the recipe. Is there any chance you’d post that online? It sounds delicious! I’m planning a big party and as usual, my first stop is Cooking for a Crowd. Youve guided my big entertaining for years, and every meal has been wonderful. Thank you so much. Next up is a vegetarian dinner for fifty. Within your writing, have you created a vegetarian feast with a menu and recipes? Im so sorry I did to reply to your comment last year. I am smart, a good writer, a fabulous cook, and an excellent nutritionist, but hugely challenged with technology. I just stumbled onto this section of the blog. I don’t think I’ve created a specifically vegetarian menu, but you could do so easily by running through the book and picking and choosing from the vegetable recipes. I think I’d use a great mac ‘n cheese as my centerpiece; I love the one in my “Cooking from a Country Farmhouse,” which uses lots of very sharp cheddar and a crispy garlic-herb crumb crust. Thanks, Susan. I can only agree with your self-description and I totally get the ‘technology-challenged’ part. Thanks for the suggestion, and I’ll tuck it away for the next vegetarian feast. For the most recent one, I used a recipe for a Mejadra or Mujadarra, a mideastern lentil rice dish with caramelized onions. It provided a very good base for a variety of sides, including mango salsa and cucumber raita. Splendid website, Susan. I’d been telling friends here at dinner this evening about your wonderful books and career which prompts me now to see how you’re doing. That photograph of you and Julia brought back a memory of her visit to your home in Starrucca.